The slinky—it’s not just a childhood toy; it’s also a ski-group phenomenon. It occurs when the last person in a large group finally arrives at the break spot, only to see the leaders of the group start uphill again. Traveling in larger groups can cause a variety of challenges and logistical problems, not just related to the slinky, too—think pacing, communication and differing goals for the day. While I personally recommend traveling in a group of three or four people, some days call for a posse. When they do, here’s how to keep the wheels from coming off the proverbial wagon. Understand your goals for the day and make sure everyone else in the group does the same. If you’re headed out for a tour with a lot of people, often the goal is to socialize and have fun. The “party ski” is best executed in low-consequence terrain. If some people feel the need to push their boundaries, communicate your intentions before leaving for the day. Have a plan and take the time to chat with your partners before leaving the trailhead. Look at the forecast, any recent avalanche activity and recent or current weather to better choose terrain appropriate for the day’s avalanche problems and the forecast. 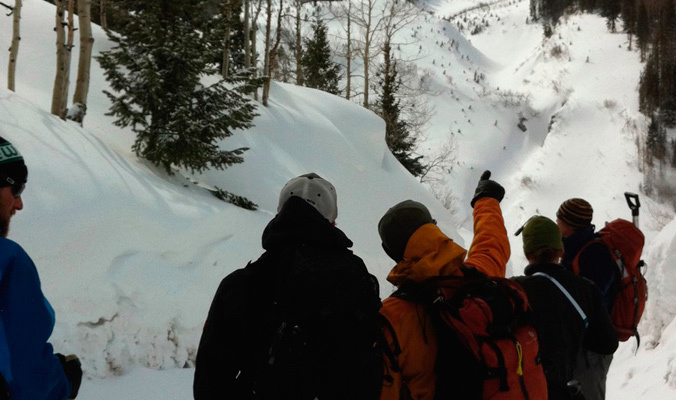 When picking a place to ski, think about taking one or two big steps back if you’re in a big group. Large groups face challenges in decision-making and communication, so to set yourself and your group members up for success, choose terrain that offers room for mistakes—build in a margin of error. With a larger group, this planning process is really important, and if during the day your group splinters into a couple of smaller groups, make sure there is communication between the groups. The last thing you want to do is end up skiing on top of each other. Make sure everyone has a voice and veto power. This may sound simple, but achieving this can be difficult in practice. For starters, make sure everyone has a say in the plan and that there is buy-in before you leave the trailhead. There might be instances when you can explore concerns and mediate them, but as a baseline, commit to going with the most conservative voice. Have an agreed upon approach to communication. Are you going to stop every hour to reassess? Are you going to reconvene halfway up the slope and at the top? Who is gathering information? How are you collecting data? When are findings, concerns and opinions shared? Are you going to use a checklist to guide your communication and decision-making? Are you going to use a rule-based tool? Whatever the answers to these questions, commit to an approach and stick with it. Don’t be afraid to speak up. It’s easier said than done, but if you’ve have a bad gut feeling, chances are you’re not the only one. Looking back on accidents that have happened in big groups, often multiple people have had a bad feeling but hesitated to speak up assuming that others around them knew better. In the professional avalanche industry, we use a technique called “Crew Resource Management,” which is a step-by-step strategy to communicate concerns based on speaking your truth—good feelings, bad feelings, questions. If your group doesn’t make space for you to do that, choose another group with whom to tour. Bottom Line: Traveling in a large group has its challenges. Communication tends to be trickier and objective setting can be hard. In order to have success on those group-shred days, make sure your terrain matches the challenges of skiing in a posse. After all, the goal is to have everyone go home happy and in one piece. Sarah Carpenter is the co-owner of the American Avalanche Institute and an AMGA-certified ski guide. Her first job out of college was ski patrolling at Bridger Bowl, Mont., and she’s been working in the snow and avalanche industry ever since as a patroller, ski guide and avalanche educator. Best way to manage large groups: limit them from forming by saying no.